What’s Swimming in the Open Water Near the North Pole These Days? The above image, provided by NASA, shows the Northern Hemisphere polar region on September 5, 2016. To get some sense of the size of this region of low-concentration sea ice, the bottom edge of this capture represents approximately 300 miles. For a point of reference, the North Pole can be seen where the lines of the satellite image frames converge in the lower left-hand side of the capture. All throughout this satellite shot, we see large expanses of open water. The smaller openings are five to ten miles wide, with very large openings ranging as much as 50 miles long appearing as well. Cloud cover is present throughout the image and blocks some visibility to open regions on the Siberian side of the Pole (upper section of the image) and over the Pole itself (lower left). Loss of ice in this region of the central Arctic is similar to and perhaps more extensive than that seen during 2010 and 2013. In 2013, strong storms combined with weakened ice states resulting in severe melt near the North Pole, with ice becoming more dispersed throughout the Arctic. This year, both storms and heat have hit the ice hard. Now, ice edge extent is far lower than in 2013 even as low-concentration ice floes and open water are visible near the Pole. As such, the overall health of sea ice is dramatically worse during 2016. 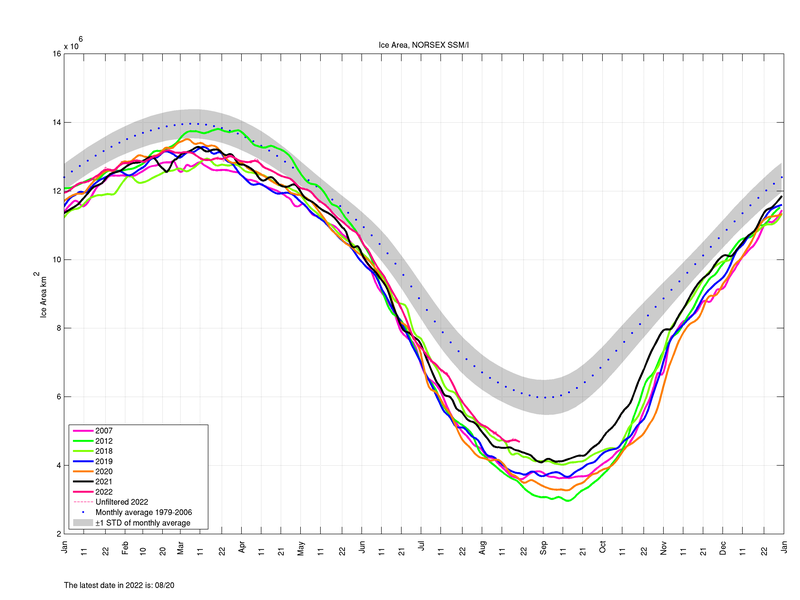 The large, open sections of water near the Pole appeared as sea-ice extent and area in many measures fell to second lowest on record for this time of year. Some measures (shown in the middle image above) have come uncomfortably close to the 2012 record low line. Overall, 2016 is a very bad year for sea ice. And the weird prospect of polar bears (or anything else) being forced to swim at the North Pole is not at all something to brighten one’s day.